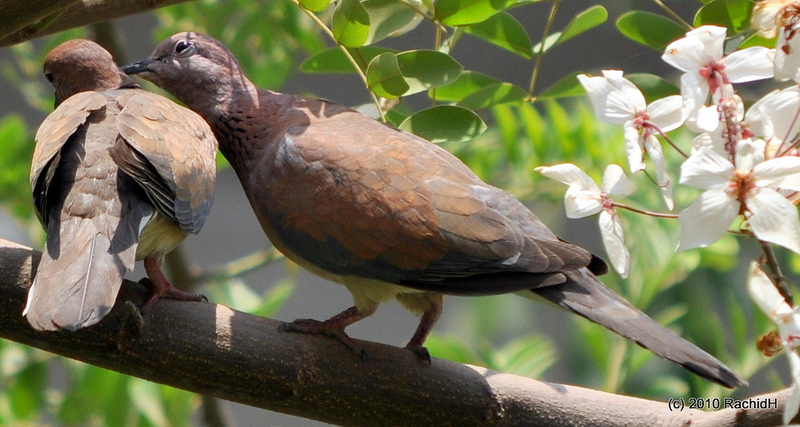 The Turtle Dove and Laughing Dove display distinct behavior and are morphologically and genetically different. However, microhabitat selection and reproductive success details of the two species are still poorly studied. The geographic distribution of the Laughing Dove in North Africa has clearly expanded nowadays. The breeding ecology and nest placement of this species have been studied previously, but little is currently known about its life history in Algeria. This study aimed to provide the basic information on the breeding biology of the Laughing Dove in Algeria. During two consecutive breeding seasons (2013–2014), the clutch size, brood size, chick survival, timing of breeding, densities of breeding pairs, nest placement, and the main causes of nest failure of the sympatric Laughing Dove and Turtle Dove were studied in an olive orchard in Guelma region, northeast Algeria. Clutch size, brood size, chick survival, the estimated productivity, and nest placement of the two species were similar but timing of breeding and population densities were significantly different. Finally, the largely coincident egg-laying period and the similar clutch size of the two species seem to be the main factors behind their similar survival rate and productivity in our study area. This entry was posted in Algeria and tagged breeding ecology, breeding success, farmland, Laughing Dove, Spilopelia senegalensis, Streptopelia turtur, Turtle Dove. Bookmark the permalink.